Notes: I took a quick trip to Hoe Mill Lock today for some pictures. The lock is always very peaceful, and the boats moored there give some pleasing reflections. Notes: A bit of a grotty day but Alistair and I were determined to have a walk somewhere. Maldon Quayside seemed like a good idea. It was rather grey and moody. Notes: I went to Southend today to drop off some films to be developed by John Salim – he’s done quite a few rolls for me now and is always very efficient and quick to turn them around. I finished off this roll along the seafront before taking it to him with the others. Less in evidence here is the Foth’s rotational issues, but instead we get lots of stripes. Hey ho! Notes: This evening’s outing had to wait for the rain to ease off, but once it was dry I headed to Woodham Walter for a little stroll to audit some footpath for The Big Pathwatch. One section took me along the edge of The Warren Golf Club. Once again, the Derby’s quirky rotation-and-double-exposure-type-effect has given this shot a unique feel. Notes: A fairly miserable, wet day meant I had to think of something a little bit left-field for a picture today. Here’s the A12, looking fairly empty, as it had just started to rain again. Another shot with my quirky “rotate-o-matic” Foth Derby. Notes: Today I went to a geocaching social meet up in Halstead. Afterwards I went for a wander in the town to look for pictures. I was testing out my newly-arrived Foth Derby II – a little folding strut camera made between 1931-1936. It looks to be in very good condition and handled well. Having developed the film, I realise several things are going on with it – the white pin-prick highlights are probably from minute holes in the bellows. You can’t see it much in this shot, but others have severe striping horizontally across the frame – probably from thinning of the cloth focal-plane shutter. But the most interesting thing is that most of the shots from this roll appear to have some weird refracted image of the scene to one side, slightly rotated and at different angles. 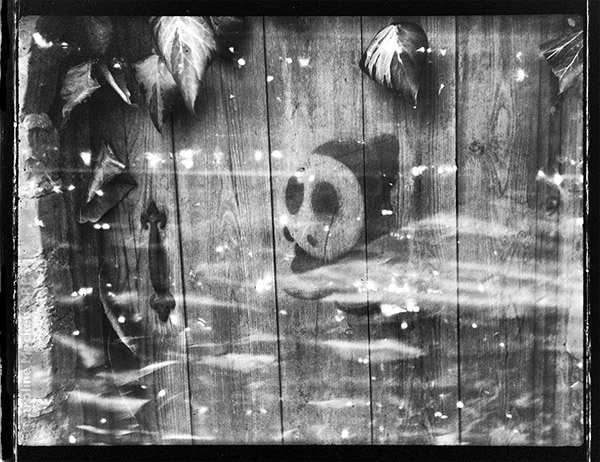 I haven’t made a double exposure on any of them – I was very careful to wind the film on after each frame. I have looked through the lens elements with the shutter open, there’s nothing obviously broken or out of alignment. I suppose I should be disappointed, but actually it gives each image a completely unique look, so I have decided to embrace its quirkiness! And this shot makes a great image for Treasure Hunt Theme #55 – Spin.